I was simply in the mood for something simple. I figured it was a good time to start working on what I hope to become my favorite old-fashioned chocolate cupcake recipe. I already have a rich chocolate cupcake recipe I love that I have used a lot this past year, but sometimes I want something that reminds me of the chocolate cake I ate as a kid. This is the recipe I normally use, which is a slight variation from a recipe in an old Better Homes & Garden cookbook my mom had forever. While I think the recipe is very “old-fashioned” I did want to give it a boost and enhance the chocolate flavor. I started with the recipe above but adjusted some ratios which really involved adding an egg, more butter, and more cocoa. I also added instant espresso powder as I saw this in a number of old-fashioned or devil’s food type recipes. Lastly instead of the “dump it all in one bowl and mix” method, I decided on using the typical creaming method which involves creaming butter with sugar, adding eggs, then alternating dry and wet ingredients. Ultimately the cupcakes came out great. The flavor is indeed richer and more chocolatey while not super intense. The cocoa and milk keep it mellow. The texture is somewhat spongy, but not as spongy as a sponge cake. It is moist enough, but the kind of cake you want to eat with a glass of milk. I think I will decrease the amount of espresso powder in subsequent tests as I could kind of taste the coffee and only really want to taste chocolate. One last thing before I get on to the recipe. As you may have noticed my posting frequency dropped off somewhat this month. I am afraid that posting will be intermittent over the next couple months. I promise to pick it up as soon as I can. 1. Beat butter until softened. Add sugar and beat until light and fluffy, about 3 minutes. 2. Add eggs, one at a time, beating 30 seconds after each addition. 3. Measure the flour, baking soda, salt, cocoa powder, and espresso powder into a medium sized bowl and whisk to combine. 4. Measure the milk and vanilla into a measuring thing. 5. Add about a third of the dry ingredients to the butter/sugar and beat to combine. Add about a half of the milk/vanilla and beat to combine. Continue adding, alternating between dry and wet and finishing with the dry. 6. Scoop batter into cupcake cups about 3/4’s full. Bake at 350 degrees for about 25-30 minutes or until a cake tester comes out clean. Note: I try to use the best quality cocoa I can find. It makes a huge difference. 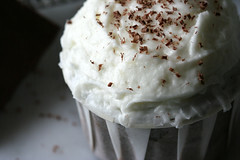 For this recipe I used Valrhona cocoa. 1. Beat butter briefly, scrape bowl. 2. Add the sifted powdered sugar and milk. Beat until smooth. 3. Add coconut and mix until combined. 1. 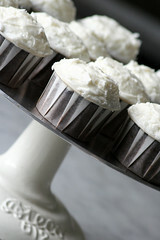 Top cooled cupcakes with coconut-buttercream frosting. 2. Top with chocolate shavings.